Paramount has found their voice for Sonic. I hate to spoil it for you, but it’s not Roger Craig Smith. 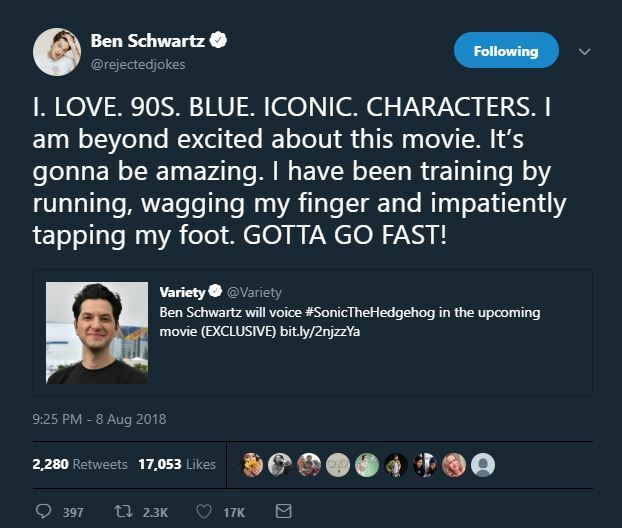 Actor Ben Schwartz has signed on to lend his voice to the Blue Blur in the upcoming Sonic movie, according to Variety. Don’t worry if you think Schwartz’s performance of Sonic won’t be on par with Smith’s. He’s currently voicing Leonardo in Nickelodeon’s Rise of the Teenage Mutant Ninja Turtles and Dewey in the DuckTales reboot–two cartoon characters with an affinity for the color blue. Schwartz is a true blue dude, so Sonic is just another blue character on his voice-acting bucket list. I’ve grown accustomed to Smith’s portrayal of Sonic in the last eight years, so the news of Schwartz being cast as Sonic shocked me. But based on his performance in DuckTales, I’m confident that he’ll make Sonic sound as youthful as Jaleel White and Ryan Drummond did. Sonic the Hedgehog speeds into theaters November 15, 2019.